The McCool's visit Castle Leslie to ride horses and soak in castle history in Ireland. 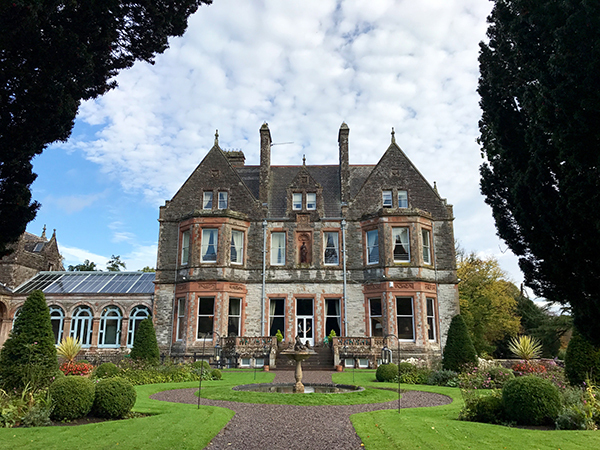 With 1000 acres devoted to relaxed luxury and equestrian fun, Castle Leslie Estate makes an ideal base for a romantic, family, or friends Ireland getaway. The estate has been owned by the horse-loving Leslie family since the 1660s. In fact, the land was granted to the Leslie family by Queen Elizabeth I for saving her life, on horseback of course. 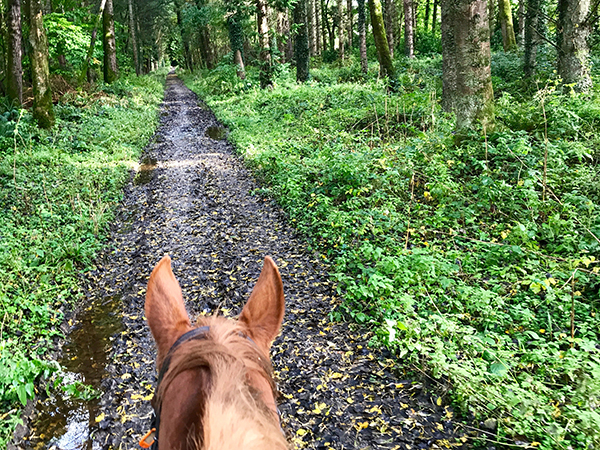 Between the ears and on the trails at Castle Leslie. If you want a classic experience, book a room in the castle. Spacious, plush rooms with Victorian bathrooms and absolutely no TVs are a luxurious step back in time. (The castle does have excellent free wifi.) Paul McCartney took the Red Room when he was married at Castle Leslie, but we loved the Blue Room next door. A view of the castle. The Lodge offers more modern rooms surrounding the stables at the Equestrian Center. Horse fans will love the decks over-looking the barns and direct access to the stables. The Lodge is also home to a pub, upscale dining room, and other comfortable gathering spaces where riding togs are more common than ties. 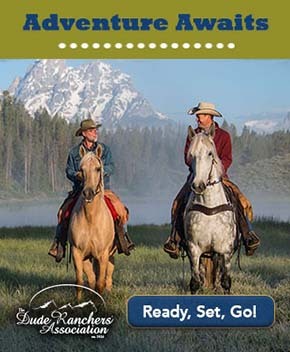 Castle Leslie Estate offers equestrian outings for every level of riding experience. 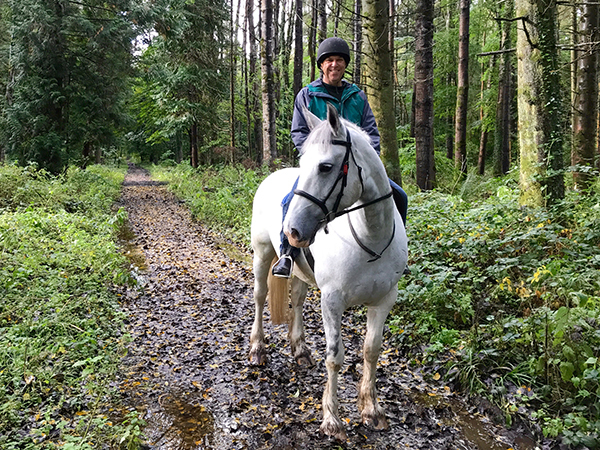 We novices signed up for a gentle hack through the woods accompanied by expert staff. 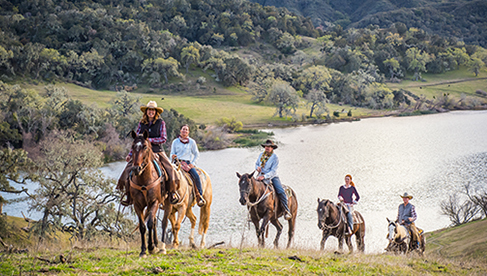 Experienced riders can splash through the lake and tackle the cross country jumps. All riders are evaluated in the ring before heading out on group rides. Charles McCool saddles up in Ireland. Travel Tip: If you are traveling with children, consider booking The Nursery and an adjoining room for the adults in the castle. 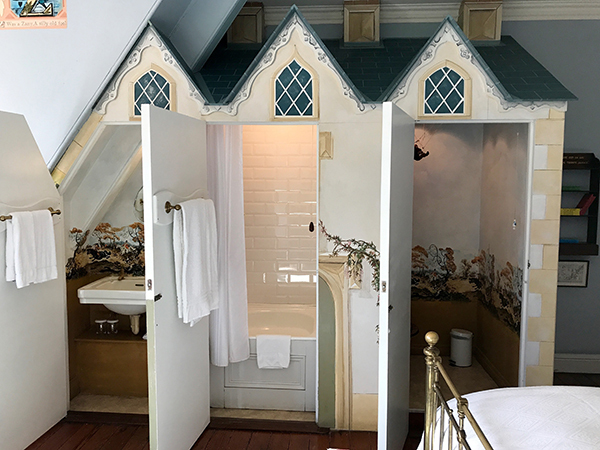 Your kids will love the en suite “bathroom in a castle”, complete with classic illustrations of Thelwell ponies. Castle Leslie is family friendly, offering amentiies for kids to enjoy... including the bathroom in a castle. Article and photos by Julie McCool of Fun in Fairfax VA and Charles McCool of McCool Travel. Follow them on social @CharlesMcCool and @FunInFairfax. The McCool's stay was hosted by Castle Leslie Estate. All opinions, photos, and text are their own.